Beginner's Photography Classes: Photography Classes' Notes - To TFP or Not TFP, That's The Question. Before we continue, let's look at the history of TFP. Here's Wikipedia's definition of TFP. Before digital photography, to develop film and prints was solely a skill of the photographer or at the labs. An aspiring model back then, even now, don't have the money to pay for labs fees even if the photographer allowed them to walk away with the negatives. Developing prints for the TFP shoots is the responsibility solely rest on the photographer. Typically, a photographer needs a subject to shoot a new lighting idea and concept, and a model is in need of new prints to diversify her book. In the pre-internet days, there were a meet-up group notices posted on bulletins at local hangouts and cafes. The meet up groups meet at a park, where photographers and models converged. They would look at each other's book and see what kind of shots are missing from their book. It can be anything like full body shots, or portraits, for example. Then the group split up and shoot those missing shots. First, the ownership of the photograph always belongs to the photographer. It's the same as the painter owns the rights to his painting. A photograph is a graphic representation of light photons bounced offer of the subject, the model. Second, TFP comes in many kinds of agreement, but usually it's the photographer who is granting the usage licenses of the photograph to the model. Usually for the model's portfolio of agreed upon photograph. These days it can be used almost anywhere from online portfolio to social media accounts. How it is, agreed upon vary greatly, for example, one select photo by the photographer, one to two images per hour spent at the shoot, and etc. Third, before the photoshoot, draft out a release form for the photoshoot. The release form frees the photographer to use his photograph after the shoot for anything at his discretion. Such as submitted the photos to publications, selling prints, or to stock-photography agencies. The model's payment is the photograph itself. This is normal since most publication demands a model release form if the photographer's submission gets accepted. Testing is another word that's used mostly by modeling agencies. The test can be free or paid. Payment is by the agency, who will deduct the model's payment eventually. Free is if you're not famous enough. Typically, tests are to give the new model a chance to experience a photo-shoot in a professional setting without fear of ruining client relationships of the agency. If you're being paid, it's likely you're a well sought after photographer in general, and you had worked with the modeling agency before on jobs or you can recommend "new faces" to your client. Don't bother with model release from test shoots. Since both model and yourself is working on getting sought after, AKA famous, that you may be riding on the model coat tail, too. Most photographers are flexible with this and don't care too much for the legality. 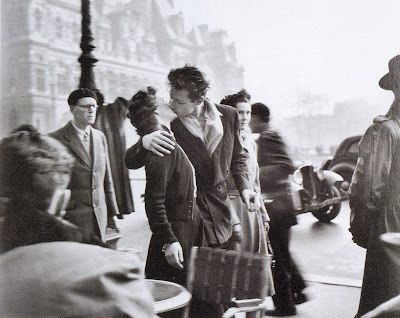 Do you know of the photograph "The Kiss by The Hotel de Ville" by Atelier Robert Doisneau? The shot was to mimic a candid moment of two young couple kissing caught by the camera of quick photographer being at the right place at the right time. In reality, this shot was part of a series on Paris lovers for Life Magazine. The magazine demanded a release form and these two couples are hired actors by Robert Doisneau. This print was auctioned for a lot of money, and the actors in photograph wanted the money from the sale of the photograph. In fact, the actors sued for royalties (source: NYTimes). Without the release form clearly stating the photograph was payment, the photographer might have been able to get the case dismissed. So all this talk is to protect you, but I don't want you to be paralyzed by this. I just want you to be informed that it's your right not to accept TFP as your payment because it was never theirs to offer in the first place. Try to avoid such offers, but do pry a little and find out what are they using the photograph for. For instance, I work with other bloggers that are closely related to my field - fashion. So when a fashion blogger is looking to for a photographer to shoot their post. That piques my interest. Why do I do it? It's for by-lines. A by-line identifies myself as the photographer that took this shot to the audience that I want to see. In these days, this by-line can be a link to my site with the anchor text like "Photography by Charlie Wang". This is especially important depending on the volume of unique traffic to their blog. Here's an example of my work for fashion blogger Jennifer Barthole. And frankly, photography sometimes needs that copy content to sell the photograph. "The Kiss" for instance was for a Time Magazine article. Yes, it's a published work, but different times. A blogger with 20,000+ unique visitors a month on the internet is no different from a magazine in those days. However, if someone wants to sell something for their business that you will photograph, then it's not ok. Especially, people that want all the rights without compensating you with something of value or cash. And TFP is not something they can offer you. It was never theirs to offer. TFP or TFCD is not an offer to you, the photographer, by models or a person selling something. Model release if your friend. Test shoot models usually won't sign a model release form; their likeness is their bread and butter, too. Don't be paralyzed by the legality, and allow yourself to be open to offers other than money. It is better to be everywhere with your work. Shooting models can be fun and glamorous, but if you're not learning new lighting, trying a new lens, or adding to your portfolio, it's really pointless to continue this path. How you should go about it, depends on what stage you are in your photography. If you're starting, then and just need someone to shoot with, then it's pretty open. When you're kinda skilled, then start looking at the offers that can expose your work to a channel you normally don't have access to. Bloggers of your particular niche is one, say for food photography. And if you have any suggestions and questions about how to go about it. Feel free to comment below. This is Charlie Wang, signing off.